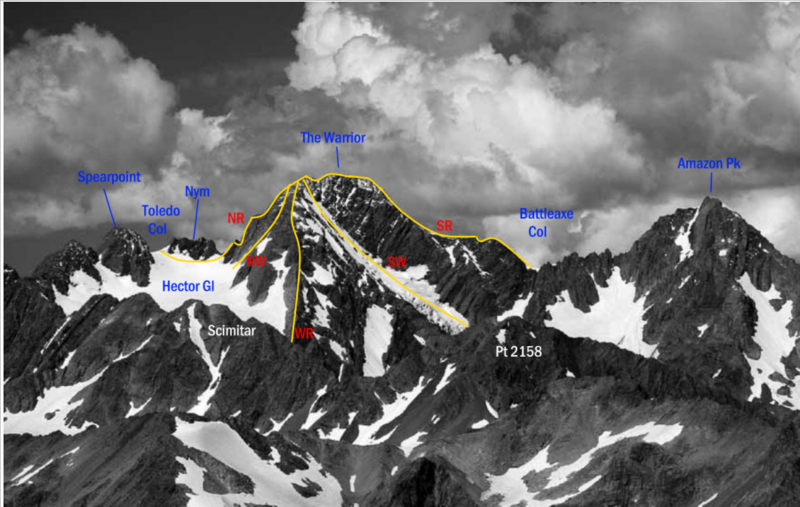 From Toledo Col, skirt under Nym Peak then head up to the ridge, which offers a steep climb on good red rock that was mostly belayed on the first ascent. The lower part of the ridge is broad enough to offer a selection of routes. Higher up, a short section of snow leads to the summit. Reach the Hector Glacier either via McCoy Stream and Toledo Col (easier) or via Billy McCoy Stream (much more difficult). From the head of the glacier two prominent gullies cut the north face. Take the gully on the right, ascending snow but climbing through a small rocky notch if snow cover is low, then follow loose rock to the summit ridge. Follow the broad, loose upper West Ridge over the low peak to the summit, turning a small block on the east side. The original route followed Billy McCoy Stream to the Hector Glacier and reached the West Ridge above the Hector icefall. The upper Hector Glacier is now typically cut off at the icefall and access to the ridge is best by way of the upper McCoy Stream and Toledo Col. Once at the ridge, traverse two triangular faces before continuing up the ridge on good rock. The ridge narrows and is exposed in places. The rock on the northern side of the ridge is good and the ridge broadens before the low peak. From the bottom of the upper Hecuba Glacier, follow steep snow and ice slopes up and left, over a schrund, then climb above the icecliffs and follow a prominent rib leading almost directly to the summit. 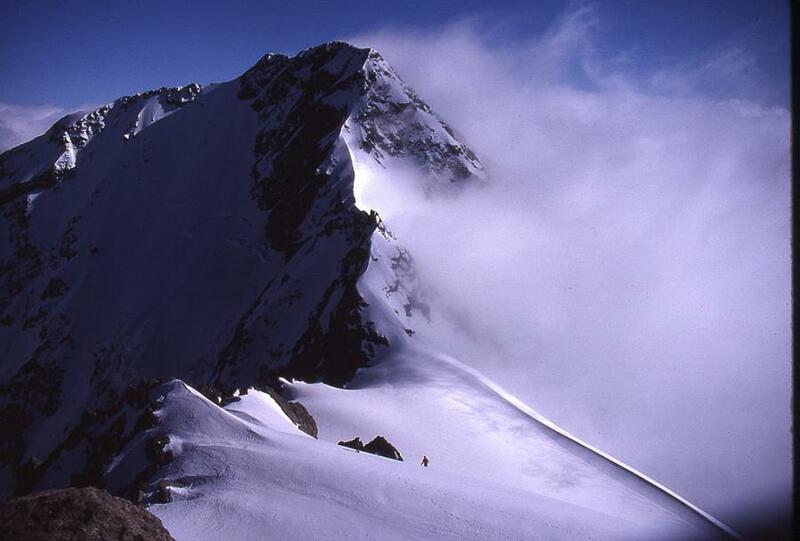 The South Ridge is gained from the vicinity of Battleaxe Col or as part of a traverse from Amazon Peak. If approaching via Billy McCoy Stream and the Hecuba Glacier, access may be difficult or impossible. From the head of the Hecuba Glacier, take a couloir that gains the South Ridge on the Amazon side of Battleaxe Col. The ridge involves some good red rock but also badly broken greywacke and argillite, including a section of difficult rock over the buttress that trends down to the Kirk Glacier. From here, move on to snow on the Kirk side to avoid gendarmes, before regaining the ridge to the summit. From the upper reaches of the Kirk Glacier follow a broad snow slope into a narrow couloir slightly west of the summit, which leads directly to the top. From the head of the Kirk Glacier climb steep ice leading north on the right (may be cut off late season) for about 400 vertical metres. Then follow a steep couloir to a prominent shoulder on the East Ridge. Continue up the rocky East Ridge to join the summit ridge a short distance south of the summit. Cross the schrund at the base of the spur then climb up an open book corner with solid rock pro. Follow this corner of stable red greywacky for three pitches. Climbing on the spur is straightforward.. The rock quality decreases with height, ending in a classic, weetbix scramble up onto the summit ridge.